How Can I Go Myth Adventures? Where is Myth Adventures in McAllen on the Map? The staff is EXTREMELY knowledgeable and will gladly help you find anything you're looking for. Every time I've been there I'd chatted with them and they're always friendly and tell me about products they'll be carrying in the near future. It's also one of the best local sources for GunPla and various figures and model kits in general. Prices are fair considering a lot of their stock is imported. Highly recommended place over all. Great store..i have been goung to it since the 80's. I liked it since I don't have much choice when it comes to the valley. 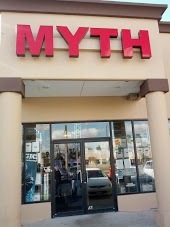 There really isn't a better place to go when you want something than Myth. I know the staff there are always helpful, they always know what they are talking about and they always have new inventory for me and others. Even things that I didn't know I wanted are there and I always leave a happy customer. I would recommend this place to anyone that really wants to check it out and stock up on their anime needs. Awesome place! they have it all! staff members are friendly and knowledgeable. Nice Shop, Been going since a kid.